Each door is professionally produced in selected Jarrah or Tasmanian Oak and finished with high quality oil for UV and weather protection. Enhance the features of your existing doorway by selecting the style to suit your needs. Choose from our range of authentic doors or design your own. Standard charcoal flyscreen wire is allowed for in the price, however if children and pets share your home, we recommend you consider "Tuff or Stainless Steel”. We welcome discussion as to the wire which suits you best. 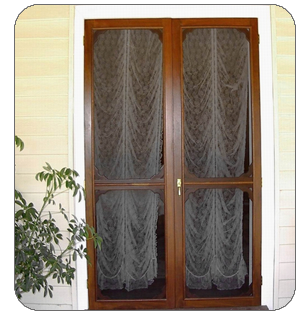 Screen Doors & Windows and French screens can be made to measure, complimenting your home. You may wish to consider Painted Screen Doors finished in UV weather protected acrylic. An Obligation Free Quote is provided. A Deposit of $100.00 /door or screen is requested. Your Order is confirmed on receipt of a deposit.